Planning on taking the new CCNA or CCENT Exam? Not sure exactly what material you need to know? All the most useful nuggets of information, IOS commands and facts from the CCNA and CCENT syllabus are right here, and we promise it will help you learn and memorize the key information required to obtain the Cisco CCNA or CCENT certifications. How do I get this great training resource? It's part of our excellent CCNA prep center, that has helped thousands of people pass the CCNA since 2002! Pass the CCNA or CCENT the First Time with us! We are confident that you will pass your certification exam after using Internetwork Training paid products. We offer the Test Pass Guarantee to help convey to you our confidence in our products! If you sign-up for our premium account today you will also receive our 60-page subnetting eBook completely free, to help you master the subnetting techniques required to pass the Cisco CCNA or ICND1 exam. Instant Download! No more waiting for days for the post to arrive! Transfer to your phone or tablet for revision on the move! Easy to use. Easy to understand. Easier to Pass! Well, it's simple. We want our CCNA prep center to be the most indispensable CCNA exam resource you can buy. Plus, you're already paying a lot money to take the exam. Why should you spend way more? Is the information contained in these downloads up-to-date? Yes, all the information relates to the latest Cisco CCNA 200-125 syllabus and all the topics in the ICND1 (100-105) and ICND2 (200-105) exams. Can I download a free sample? 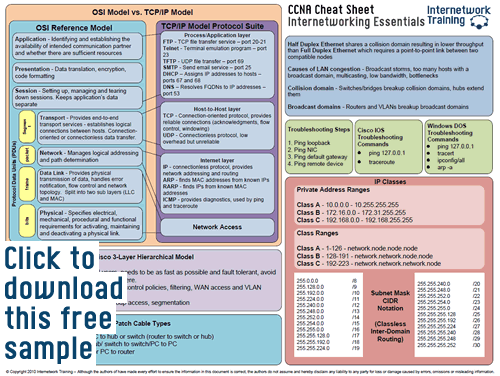 Yes, we have a 1-page sample CCNA cheat sheet. How many pages is the cheat sheet? The cheat sheet comes in two parts and totals 21 pages crammed full of carefully selected info perfect for memorizing before the exam. How many pages in the subnetting eBook? The subnetting eBook is 60 pages long, with lots of detailed examples. Can you send me the cheat sheet in the post? Unfortunately not. However you can download it in seconds rather than waiting days for the post, plus there is nothing stopping you from printing it out once you have downloaded it. Is this a brain dump? No, we have a strict no braindump policy, all the information on this website is aimed at helping you become a CCNA by passing the exam on your own merits. What topics does the cheat sheet cover? What topics does the subnetting eBook cover? I've become a premium account holder, how do I download it? You should have received an email with a link to your download. Check your Spam filter and then send us an email with your order details and we will resend your download link. Thanks for taking the time to read this. We wish you the best of luck on the exam.